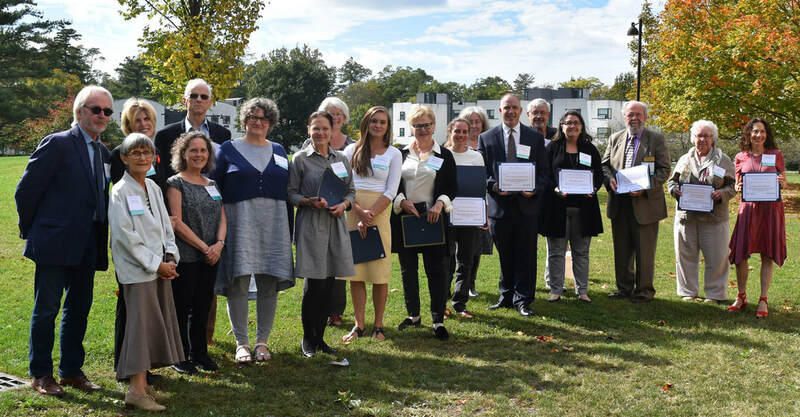 Greater Hudson Heritage Network’s Awards For Excellence program seeks to recognize and commend exceptional efforts among GHHN members. Awards are made to projects that exemplify creativity and professional vision resulting in a contribution to the preservation and interpretation of the historic scene, material culture and diversity of the region. ​at the Bear Mountain Inn & Conference Center. Education: can include programming for schools, children, adults, groups with special needs, lecture series, demonstrations, etc. Individual Achievement: an individual’s long-term efforts towards promoting and furthering a knowledge and appreciation of New York history. Project: can include exhibition (physical or online), restoration, preservation, special research, web site, etc. Publications: can include book, exhibition catalog, audio, visual, etc. Nominated books should contain accurate citations, an index and a bibliography or list of works cited. We will no longer accept nominations for newsletters or pamphlets. Nominations reflecting work in creative re-interpretation of collections are strongly encouraged; nominations of collaborative or regionally focused projects are especially welcome. Any GHHN member organization or individual* can be nominated for projects completed in the last 12 months prior to September 2018 (projects conducted from October 2017 through September 2018). Projects not yet completed must have reached a point sufficient to permit judgment of merit. You are encouraged to nominate your own organization. If you have received Awards for Excellence for the last three years, we ask that you step out for a year to give your colleagues a chance to be recognized. *Not a GHHN Member? Click here to become one! Nominations will be judged on the evidence of quality, creative use of resources, and long term significance by a peer jury of professionals, representing the history, museum, archives, and academic fields. Please note that this is a paperless nomination process (online nomination portal will open on Wednesday, June 20, 2018). All materials must be submitted online by 11:59 PM on Wednesday, August 1, 2018. The link to the nomination portal will be located on this webpage. The portal will open on Wednesday, June 20, 2018 and will remain open until 11:59 PM on Wednesday, August 1, 2018. You may fill out your nomination at any point during that date range. Once signed in to your Submittable account, you may save a draft of your nomination online and come back to it as often as you wish. However, once your nomination has been submitted, you cannot make any edits or changes. Incomplete nominations will not be considered. To begin your nomination process, you must create a FREE Submittable account. You will fill out a form with your name, email address and a password. If you already have a Submittable account (either from our Conservation Treatment Grant Program or Collection Needs Assessment Program or from other grant programs), you should use that username and password to log in. You will need to be logged in to complete and submit your nomination. Once you have logged in, you will be able to access the nomination form. Some parts of the nomination will be filled out in fields in the portal, and other parts of the nomination will need to be uploaded as PDF files. In an uploaded narrative of one page (Word or PDF), summarize concisely why you think this nominee merits an award. Indicate what was accomplished, how it served the organization’s mission, and/or how the project contributed to preservation & interpretation of the historic scene, material culture studies, public awareness, enjoyment and/or diversity of New York State. We highly encourage you to include any support materials that document and enhance the nomination as a secondary attachment. Files can be uploaded as a multi paged Word or PDF file (Maximum of 5 pages, no page limit for submission of publication); individual image files as JPG, TIFF or PNG; Audio as MP3, MP4, WAV, WMA; or Video as MP4, MOV or WMV. If available, please include any available supporting publicity: newspaper articles, photos, reviews, etc. of the nominated work. For Nominated Projects: Please include photographic, audio, or video documentation. Exhibitions are encouraged to provide example copies of labels and floor plans. Web sites should simply include the Web address in the narrative. For Nominated Publications: Must include six (6) copies of the publication if sending in hard copies to GHHN offices. Publications may also be submitted electronically. Important note: submitted materials will NOT be returned. For Nominated Individual Achievement Awards: Should include examples of accomplishments or testimonials from individuals (not the nominator or nominee) about the nominee's achievements/lasting impact in the field. 17. Will you be sending in physical materials to the GHHN Offices? Yes/No. If you are nominating a publication or book, and are choosing to send in physical materials (instead of submitting an electronic version of the publication) please send SIX copies of the publication to the GHHN offices postmarked by August 1, 2018. All other collateral materials may be uploaded as a PDF. IMPORTANT REMINDER: Submitted collateral materials will NOT be returned. Questions? Any questions concerning the Nomination Process should be addressed to Priscilla Brendler, Executive Director at 914-592-6726 or e-mail director@greaterhudson.org. ​ Any technical questions about Submittable or the online submission process should be addressed to Kerry Sclafani, Program Coordinator at 914-582-3353 or e-mail info@greaterhudson.org . Good Luck!